(Auch) Schweden kann ein wichtige Rolle im Kampf gegen die Straflosigkeit von Folter in Syrien spielen. Deswegen haben am 19. Februar 2019 neun Folterüberlebende aus Syrien in Stockholm eine Strafanzeige gegen hochrangige Beamte der Regierung von Syriens Präsident Baschar al-Assad eingereicht – unter anderem wegen Verbrechen gegen die Menschlichkeit. Die Männer und Frauen stellten die Anzeige gemeinsam mit den ECCHR und den syrischen Juristen Anwar al-Bunni (Syrian Center for Legal Studies and Research, SCLSR) und Mazen Darwish (Syrian Center for Media and Freedom of Expression, SCM), der Caesar Files Group sowie der schwedischen Organisation Civil Rights Defenders (CRD). CRD und das ECCHR, deren juristische Recherche und Analyse Grundlage der Strafanzeige sind, arbeiten seit langem eng mit den Anzeigenerstatter*innen zusammen. Die Anzeigenerstatter*innen hatten sich im Frühjahr 2011 an den friedlichen Protesten gegen die Assad-Regierung beteiligt. Dafür wurden sie verhaftet und zwischen Februar 2011 und Juni 2015 – je nach Fall – in Damaskus, Aleppo, Raqqa und anderen Städten in 15 verschiedenen Haftzentren von vier der insgesamt fünf syrischen Geheimdienste inhaftiert. Dort wurden sie schwer gefoltert, außerdem wurden sie Zeug*innen von Folter bis hin zum Tod anderer Gefangenen. Sie berichten über Schläge mit Stöcken, Kabeln und Plastikrohren, Tritte gegen Kopf und Genitalien, Elektroschocks, Schlafentzug und sexuelle Misshandlung. Nach ihrer Entlassung verließen sie Syrien und leben inzwischen in Europa. In Schweden nutzen sie das Weltrechtsprinzip, um die Verantwortlichen für das, was sie erlitten haben, vor Gericht zu bringen. Das Ziel ihrer Strafanzeige: Die schwedische Justiz soll gegen 25 namentlich benannte und weitere unbekannte hochrangige Geheimdienstbeamte ermitteln und internationale Haftbefehle erlassen. Die Vorwürfe im Sinne des schwedischen Strafgesetzbuches und des Gesetzes über die strafrechtliche Verantwortung für Völkermord, Verbrechen gegen die Menschlichkeit und Kriegsverbrechen umfassen Verbrechen gegen die Menschlichkeit, Kriegsverbrechen, Folter und demütigende und erniedrigende Behandlung, Vergewaltigung, schwere Körperverletzung und illegale Entführung. Die Strafanzeige in Schweden steht in einer Reihe mit weiteren rechtlichen Schritten in Deutschland, Frankreich, Österreich und anderen europäischen Ländern. In Deutschland trugen Zeug*innen aus vergleichbaren Strafanzeigen sowie Fotos und Dokumente der Caesar Files Group im Juni 2018 entscheidend zu einem internationalen Haftbefehl gegen Jamil Hassan, Chef des syrischen Luftwaffengeheimdienstes, bei. Ermittlungen deutscher und französischer Behörden führten außerdem im Februar 2019 zur Festnahme ehemaliger Funktionäre der Assad-Regierung. Werden sie vor Gericht gestellt, wollen mindestens sechs Folterüberlebende dem Verfahren als Nebenkläger*innen beitreten. Auszüge aus den Zeug*innenaussagen der Kläger*innen in Schweden. P2 is a Syrian human rights defender and journalist. In 2012, he worked for the Syrian Center for Media and Freedom of Expression (SCM) in the "Violations Documentation Center." In February 2012, he was arrested in the SCM office together with his colleagues and brought to the Investigative branch of the Air Force Intelligence in Damascus, where he witnessed other detainees, including minors, being tortured on several occasions. One month later, P2 was transferred to the Regiment 555 of the 4th division, where shared an underground collective cell with up to 90 persons. There, he was repeatedly tortured, including by being beaten almost on a daily basis, also with cables and solid sticks as well as being exposed to electric shocks until he lost consciousness. Due to the inhuman detention conditions, P2 lost 30kg in detention. In November 2012, he was transferred to Adra Civil Prison. Following his release in February 2013, he fled to Lebanon and Turkey before coming to Sweden in 2014. By now, he has the Swedish citizenship. During detention, P2 and his fellow cell mates decided to document the names and contacts of those detained in their cell, using a pieces of fabric, a chicken bone as a pen and their own blood and rust from the cells' iron bars as ink. The final list, which contained names and hometowns of detainees, included 82 entries. The piece of fabric was put into the collar and cuffs of a shirt which the first detainee to be released was supposed to wear. P2 happened to be the first one, he wore the shirt until his final release and smuggled it out successfully. Then he started to search for the families of the detainees to inform them about their whereabouts. P5 was arrested twice. The first time, he was arrested in May 2011, because someone had put his name on a list of wanted persons. Following this arrest, he was detained in the State Security branches 251 and 285, where he was exposed to severe beatings including falaqa. He was released after two months. In December 2012, he was arrested for the second time, supposedly for being politically active and engaged in humanitarian work. He was brought again to branch 251, where he had to endure several torture sessions. Among other things, he was beaten until unconsciousness, exposed to electric shocks and shabeh. While in detention, P5 saw a doctor only once. When he told the doctor that he had problems with his stomach, the doctor kicked him hard in the stomach. He still has a hole in his knee, because he was tormented with a drilling machine. After more than one year, he was released. He arrived in Sweden in April 2015. P7 was accused of participation in demonstrations, having instigated students in his university to take part in demonstrations and of having spoken critically about the government. He was arrested in September 2012 and detained in the Military Intelligence branch 215. There, P7 was first held in a cell of about 3x4 meters in size with a number of people varying between 25 and 50, and later in a cell of about 4x5 meters holding up to 104 people. This gave the detainees no space to lie or sit down. He was allowed to use the toilet twice a day for only a few seconds. The bad hygienic conditions in the cell caused diseases and led to the inflammation of wounds. P7 was exposed to different kinds of torture, for example, severe beatings, electric shocks and shabeh. He was released after 45 days. In mid-2012, he fled to Europe and arrived in Sweden in October 2014. P8 was arrested at the age of 19 in November 2012 because she had organized shelter and collected money for internally displaced people. She was first brought to the Military Intelligence branch 215, where she was subjected to degrading detention conditions such a limited access to sanitary facilities, lack of exposure to daylight, insufficient air circulation and inedible food. During interrogation and torture sessions, she was, for example, beaten, insulted, sexually harassed and threatened with further violence. After around 26 days, she was transferred to the Military Intelligence branch in Homs where she was detained for another five weeks. There, she was, among other things, subjected to sexual violence. P8 left Syria in 2013 and has been living in Sweden since December 2014. P9 was arrested in March 2012 when gathering together with other people for a funeral. The student helped wounded people when the funeral was attacked by the military and was then, together with other participants of the funeral. He was first brought to the Military Intelligence branch in Raqqa, where he was beaten, verbally humiliated and severely hit with a cable. Afterwards, P9 was transferred to the Criminal Security branch in Raqqa. 30 to 40 people had to stay in the cell of 4x4 meters. There was little oxygen left to breathe and the detainees had to take turns in sleeping. Beyond that, he was exposed to physical torture like falaqa. Three weeks later, he was transferred to the central prison in Raqqa where he had to stay for another two weeks until he was released. He arrived in Sweden in January 2015. Hier finden Sie die wichtigsten Fragen und Antworten zu den juristischen Hintergründen des Falls. Why do torture survivors and human rights lawyers address crimes committed in Syria by filing a criminal complaint in Sweden? Serious crimes concern the international society as a whole, and must be responded to. For this reason, it is the responsibility of the national jurisdictions of third party states, like Sweden, to investigate the serious crimes committed in Syria and to prosecute the responsible officials. Thus, with this submission, the plaintiffs, together with supporting organizations, demand for steps to be undertaken by the Swedish prosecutorial authorities to address the criminal responsibility of high-level officials of the Syrian government, in particular those high-level officers of the Syrian intelligence services named in this complaint. In comparison to other European states, such as the Netherlands and Spain, Swedish law does not require presence of the suspect in the country to undertake legal steps. This enables the Swedish prosecutorial authorities to carry out person-specific investigations regardless of the place of residence of the suspect. What options does international criminal justice offer for addressing human rights violations committed in Syria? Currently, there is absolute impunity for such crimes in Syria. For the foreseeable future there is no prospect of prosecutions of perpetrators linked to the Assad government. The adoption of the Rome Statute and establishment of the International Criminal Court (ICC) in 2002 made it possible to prosecute certain cases of war crimes, crimes against humanity, and genocide in The Hague. However, this option is currently not available for the crimes committed in Syria. The ICC is not authorized to start an investigation into the crimes, as Syria is not a party to the Rome Statute and efforts by the UN Security Council to refer the case to the court are blocked by Russia and China. In August 2011, the Independent International Commission of Inquiry on the Syrian Arab Republic (UN CoI Syria) was established and has been gathering evidence against all parties to the conflict since then. It works in the neighboring countries of Lebanon, Jordan, Iraq and Turkey. The information gathered by the UN Commission is crucial for future legal investigations. The International, Impartial and Independent Mechanism to Assist in the Investigation and Prosecution of those Responsible for the Most Serious Crimes under International Law Committed in the Syrian Arab Republic since March 2011 (IIIM), set up in December 2016, is tasked with collecting, preserving, and consolidating evidence, while also preparing files of evidence that can be used by prosecutors in independent criminal proceedings. IIIM has no power to press charges or issue arrest warrants. Instead it looks to national or international courts to make use of the documented evidence. What legal avenues are available in Sweden to prosecute the crimes committed in Syria? The legal framework for prosecution of the above mentioned crimes under Swedish law is regulated by the Swedish Penal Code and the Law on criminal responsibility for genocide, crimes against humanity and war crimes (adopted in 2014). It allows the Swedish prosecutorial authorities to exercise universal jurisdiction over crimes against international law, grave breaches of international humanitarian law, over particularly grave crimes if the least severe punishment prescribed for the same crimes under Swedish law is imprisonment for four years or more, as well as for genocide, crimes against humanity and war crimes committed after July 2014 (Law 2014:406). In Sweden, the presence of the suspect in the country is not required to undertake legal steps. This enables the Swedish prosecutorial authorities to carry out person-specific investigations regardless of the place of residence of the suspect. Has this been investigated in Sweden before? Sweden has contributed to the efforts in bringing accountability for the crimes committed in Syria by opening a structural investigation, as well as by prosecuting individual crimes. Beside several convictions of members of non-state armed groups for killing and inhuman treatment as war crimes in Syria, the first judgment against a former soldier of the Syrian Army was pronounced in Sweden. These steps send a clear signal that those perpetrators who are present on the territory of Sweden will be prosecuted and convicted. However, Swedish authorities have not issued arrest warrants against those who orchestrate the policy behind grave crimes and are still in Syria. Which evidence is the complaint in Sweden based on? The complaint is based on testimonies of nine plaintiffs, extensive research and legal analysis. It revolves around the crimes committed against the plaintiffs in various detention facilities in Syria between February 2011 and June 2015. Their detention took place at different times and lasted for different periods, from several days to several years. What is the content of the plaintiffs' testimonies? The plaintiffs testified about the crimes they witnessed or were exposed to during detention, including murder, severe torture, detention in inhuman conditions, sexual violence and other inhuman treatment. These statements corroborate testimonies of other former detainees and their family members, documented by various Syrian and international human rights organizations and described in numerous reports. Who is the subject of the complaint? The criminal complaint is filed against 25 known and further unknown high-level officials of the Syrian security apparatus, including heads of the four Syrian intelligence services. Where and when have the crimes been committed? The criminal complaint addresses crimes that have been committed in 17 different sites, as detention facilities of the Syrian Intelligence Services, namely Military Intelligence, Air Force Intelligence, General Intelligence and Political Security as well as in Saydnaya Military Prison and detention facility of the 4th Division of the Syrian Armed Forces. The crimes addressed took place between February 2011 and June 2015. Which criminal complaints have previously been filed in Europe? The criminal complaint in Sweden against high-level officials in the Syrian intelligence service is part of a series of criminal complaints across Europe. So far, four criminal complaints have been filed in Germany. In March 2017, ECCHR and seven torture survivors from Syria as well as Syrian lawyers Anwar al-Bunni (Syrian Center for Legal Researches & Studies, SCLRS), Mazen Darwish (Syrian Center for Media and Freedom of Expression, SCM) submitted an initial criminal complaint against six suspects – high-level officials in the Syrian intelligence service – to the German Federal Public Prosecutor. The claimants are individuals who were detained in Syrian intelligence service facilities and who were tortured or witnessed torture. In September 2017, a group working with "Caesar," a Syrian defector who obtained thousands of photos of tortured and murdered detainees in Syrian government detention facilities, took legal action by filing together with ECCHR a criminal complaint to the German Federal Prosecutor. The complaint was directed against senior officials from the Syrian intelligence services and the military police concerning crimes against humanity and war crimes. A representative of the group provided the Federal Prosecutor with a set of high-resolution images and metadata. The "Caesar photos" present a unique insight into the Syrian government's machinery of torture and killing under Assad. In November 2017, ECCHR supplemented previous criminal complaints and evidence with two additional complaints directed against high-ranking officials from the National Security Bureau and Air Force Intelligence as well as the head of the military police and the Saydnaya military prison. 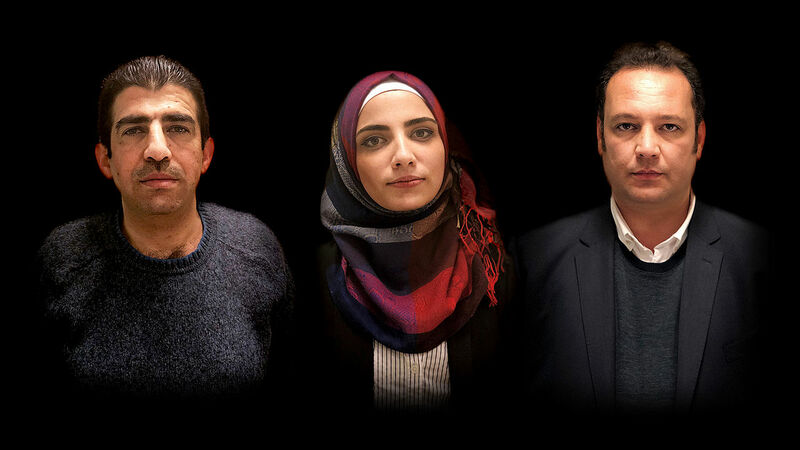 In May 2018, ECCHR together with 16 women and men from Syria as well as al-Bunni (SCLRS), Darwish (SCM) and the Center for the Enforcement of Human Rights International (CEHRI) submitted a criminal complaint to the prosecutor in Vienna, Austria. The criminal complaint addresses torture as a crime against humanity and war crime in detention facilities run by the Syrian Military Intelligence Service, the Air Force Intelligence Service and the General Intelligence Service. In France, another arrest warrant was issued in October 2018 by the French investigative judges against high-ranking officials and close advisors to the Syrian president Bashar al-Assad, namely Ali Mamluk, the head of the National Security Bureau, Jamil Hassan, the head of the Air Force Intelligence and Abdel Salam Mahmoud, senior Air Force Intelligence official as well as the head of the detention facility at al-Mezzeh military airport in Damascus. The charges include torture, enforced disappearances, crimes against humanity and war crimes. How did the so far submitted complaints contribute to the ongoing investigations? Following ECCHR's submissions in Germany in 2017, the Prosecutor's office heard testimonies of ten survivors represented by ECCHR's lawyers. In June 2018, the Prosecutor's office requested an arrest warrant against one of the high-ranking suspects named in the complaint, Jamil Hassan, who heads the Syrian Air Force Intelligence. The German Federal Court of Justice (Bundesgerichtshof – BGH) subsequently issued an arrest warrant against the suspect based on charges of systematic torture and killings as crimes against humanity committed in detention facilities of the Air Force Intelligence Directorate between April 2011 and August 2013. This measure is considered a milestone towards justice and accountability for all those affected by Assad's torture system, particularly the Syrian torture survivors and activists whose testimonies contributed to the arrest warrant. On 12 February 2019, a former member of the Syrian General Intelligence Directorate was arrested in Germany at the behest of the German Federal Court of Justice. He is suspected of being responsible for the torture of detainees in 2011-2012 in the Al-Khatib detention facility run by the General Intelligence Directorate in Damascus. This will most likely lead to a criminal trial in Germany, which would be the first criminal trial worldwide examining the responsibility of a senior member of the Syrian intelligence agencies of President Bashar al-Assad for crimes of torture. ECCHR is assisting survivors of torture in Syria in these proceedings. Their testimonies and research conducted by ECCHR contributed to the issuance of the arrest warrant against Anwar R.
In Austria, having received the submission, the prosecutor opened an investigation and heard one of the survivors who provided his testimony for the complaint.